If you are a new investor, you will likely encounter terms that you don't understand. It may seem overwhelming in the beginning but, like anything, once you become familiar with it, you realize there is no reason to be intimidated. 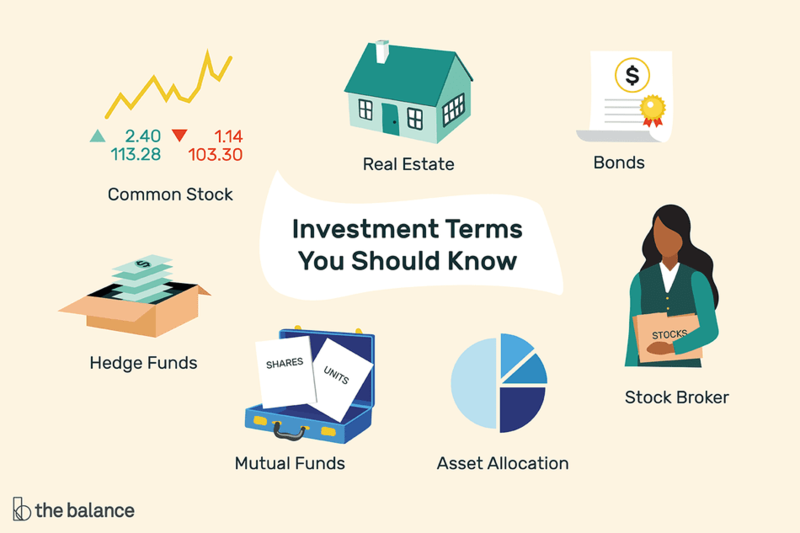 This is an introduction to some of the more common investing terms that you may encounter, providing a brief definition of each as well as links to other articles where you can read more about that topic. There are various ways to invest your money, such as in stocks, bonds, and property. You should have a clear understanding of each option to make the best decision for growing your money. A share of common stock represents ownership in a legally formed corporation. For most companies, there is a single class of stock that represents the entire company. Literally, when you own a share of common stock, you own a piece of a corporation. However, some companies have multiple classes of stock, including dual classes of stock. Often, one class of the stock will have more voting rights than another class of the stock. Owners of common stock are entitled to their proportionate share of a company's earnings, if any, some of which may be distributed as cash dividends. The best stocks are usually referred to as blue-chip stocks. Preferred stock is a class of ownership of a company that allows shareholders to get a larger dividend, and that dividend is often guaranteed. Holders of preferred stock do not have voting rights, but can receive special status if a company is going into insolvency. For example, if a company is liquidating and must pay off its creditors, preferred stock shareholders must be paid before common shareholders. In some cases, companies can repurchase shares of preferred stock from shareholders, often at a premium. It's also possible to convert shares of preferred stock into common stock, but not vice versa. There are also different types of preferred stock such as convertible preferred stock. In simple terms, a bond is like a loan. When you buy a bond, you are usually agreeing to borrow money from a government or a company. Typically, the bond issuer promises to repay the entire principal loan amount on a future day, known as the maturity date, and pay interest income in the meantime based upon a coupon rate. There are many types of bonds including those issued by governments, such as Treasury bonds, and tax-free municipal bonds. These bonds are often used to fund government operations and capital projects. There are also corporate bonds, which help companies fund their operations and invest in themselves. There are also savings bonds such as the Series EE savings bond and the Series I savings bond. There are investment grade bonds, the highest being AAA-rated bonds, and, on the opposite end of the spectrum, junk bonds. If you don't want to buy bonds individually, you can invest in bond funds. Real estate is tangible property, such as land or buildings, that the owner can use or allow others to use in exchange for a payment known as rent. When you own a house, you own real estate. When you own a plot of land, you own real estate. An investment strategy may include specific pooled or grouped classes of assets. A mutual fund is a pooled portfolio. Investors buy shares or units in a trust and the money is invested by a professional portfolio manager. The fund itself holds the individual stocks, in the case of equity funds, or bonds, in the case of bond funds. Mutual funds are a great way to get exposure to groups of stocks or bonds, freeing the investor from the need to research and purchase shares of each company individually. For example, if you want your portfolio to include more investments in smaller companies, you can purchase shares of a small-cap mutual fund. Mutual funds do not trade throughout the day to avoid allowing people to take advantage of the underlying change in net asset value. Instead, buy and sell orders are collected throughout the day and once the markets have closed, executed based upon the final calculated value for that trading day. Exchange-traded funds (ETFs) are very similar to mutual funds, except that they trade throughout the day on stock exchanges as if they were stocks. This means you can actually pay more or less than the value of the underlying holdings in the fund. In some cases, ETFs might have certain tax advantages but most of their benefits compared to traditional mutual funds are largely a triumph of marketing over substance. You can use these or traditionally structured mutual funds in your portfolio. An index fund is a mutual fund, sometimes trading as an ETF, that allows an individual to "invest" in an index, such as the S&P 500. Index funds are designed to give investors returns that are in line with the index. So if you're investing in an S&P 500 index fund, your returns should mirror those of the S&P 500. There are many funds designed to track a whole host of indexes that may include small-cap stocks, emerging markets, and specific industries. Index funds are an example of "passive" investing, as there are no fund managers actively trying to "beat" the market. The funds are simply designed to mirror the returns of the index. As a result, they usually have low expense ratios, making them cost-effective investments. The simplicity and low cost of index funds make them very good investments for people who don't want to spend a lot of time researching stocks and managing their portfolio. In fact, many financial advisors recommend index funds as a core component of every investment portfolio. A hedge fund is a type of investment partnership. Often, it's formally listed as a limited partnership or limited liability company, and the partners will pool money from investors and engage in a wide range of investing activity. Commonly, hedge funds engage in investment activity that is riskier than typical investments. Hedge funds will often use leverage, borrowed money, to amplify their returns, but can also place bets against the market to make money even if the market goes down. There are a variety of different hedge fund structures, but it's common for fund managers to charge investors 20 percent of profits plus 2 percent of assets as a management fee each year. This is controversial because managers of large funds can make millions of dollars in management fees even if investments perform poorly. Due to government regulations meant to protect the inexperienced investor, investing in hedge funds can be difficult for most ordinary investors. A trust fund is a special type of legal entity that allows a person or organization to hold assets that they will eventually give to another. For example, a grandparent could hold $100,000 in stock to a grandchild, with the stipulation that the grandchild gets that money when they turn 18. Trust funds offer tremendous asset protection benefits and, sometimes, tax benefits, if intelligently structured. Trust funds can hold almost any asset imaginable from stocks, bonds, and real estate to mutual funds, hedge funds, or art. There is a perception that trust funds are only used by the wealthy, but they are available to anyone who wants to smartly transfer assets to another person. Some investors prefer to buy real estate through real estate investment trusts (REITS), which trade as if they were stocks and have special tax treatment. There are different types of REITs specializing in various types of real estate. For example, if you wanted to invest in hotel properties, you could consider investing in a hotel REIT. REITs allow you to invest in real estate without having to buy or maintain actual buildings or land. Master limited partnerships (MLPs) are limited partnerships that trade similarly to stocks. Given the unique tax treatment and complex rules surrounding them, inexperienced investors should generally avoid investing in MLPs, particularly in retirement accounts where the tax consequences can be unpleasant if not masterfully managed. Portfolio managers are experienced investment professionals, who strategically group or pool together different types of assets into portfolios that they manage to generate a profit for investors. Asset allocation is an approach to managing capital that involves setting parameters for different asset classes such as equities (e.g., ownership or stocks), fixed-income (e.g., bonds), real estate, cash, or commodities (e.g., gold or silver). Asset classes are believed to have different characteristics and behavior patterns, thus getting the right mix for a specific investor's situation can increase the probability of a successful outcome in accordance with the investor's goals and risk tolerance. For example, stocks and bonds play a different role in an investor's portfolio beyond the returns they may generate. An investment mandate is a set of guidelines, rules, and objectives used to manage a specific portfolio or pool of capital. For example, a capital preservation investment mandate is meant for a portfolio that cannot risk meaningful volatility even if it means accepting lower returns. A custody account is an account that an institutional custodian operates on behalf of an investor to hold the investor's portfolio of securities. The custodian will record cash flows from interest and dividends, submit instructions on behalf of the investor for proxy voting or corporate events, take delivery of spin-offs and make sure the shares end up in the custody account. Custody accounts are assessed custodial fees, however, some investors don't realize they pay them because brokers may offer custody services for free or at reduced prices if the investor has a minimum account size or places a certain number of stock trades each year, referring to their custodial services as a brokerage account. An asset management company is a business that invests capital on behalf of clients, shareholders, or partners. The asset management business inside of Vanguard is the one buying and selling the underlying holdings of its mutual funds and ETFs. The asset management business at J.P Morgan's private client division is building portfolios for individuals and institutions. A registered investment advisor (RIA) is a firm that is engaged, for compensation, in providing advice, making recommendations, issuing reports or furnishing analyses on securities, either directly or through publications. RIAs can include asset management companies, investment advisory companies, financial planning companies, and a host of other investment business models. A special feature of RIAs is that they are bound by a fiduciary duty to put the needs of the client above their own rather than the lower suitability standard that applies to taxable brokerage accounts. Registered investment advisor fees have to be "reasonable" and vary among firms. In the U.S. legal system, a fiduciary duty is the highest duty owed to another person. It requires the fiduciary to put the interest of the principle, often the client, above its own. This involves disclosing conflicts of interest. This is an account organized under the Uniform Transfers to Minors Act (UTMA) of a particular state. It allows an adult to buy property, titled in their name for the benefit of a minor child until the child reaches a certain age set in the UTMA documentation with 21 years of being the maximum allowable age in most states. The adult with the title of the property is known as the custodian and owes a fiduciary duty to the child. There have been cases of parents who used the stock that they initially gave to their children to pay for their children's medical care, thus resulting in an embezzlement conviction. If the child becomes an adult and "compels an accounting," you will need to produce proof of every cash flow and statement of that portfolio or you could be liable not only for the missing money but for the compounded value of the money had it been left alone in the portfolio. A stockbroker is an institution, or individual, that executes buy-or-sell orders on behalf of a customer. Stockbrokers settle trades, making sure cash or the security gets to the right party by a certain deadline against their client's custody account. There are many different types of stock trades that you can submit to your stockbroker but be careful about becoming over-reliant on them. For example, a stop-loss trade won't always protect your portfolio. Additionally, it is sometimes possible to buy stock without a broker through programs such as dividend reinvestment plans or dividend reinvestment programs (DRIPs). There are at least 12 different types of stock trades you can place with a broker to buy or sell ownership in companies, including market orders, limit orders, and stop-loss orders. Also known as short selling, this is when an investor or speculator borrows shares of stock or another asset they do not own, sells it, pockets the money with the promise to replace the property in the future, and hopes the asset declines in price so it can be repurchased at a lower cost, the differential becoming the profit. If done incorrectly, an investor can become bankrupt. Brokers will often lend customers money against the value of certain stocks, bonds, and other securities within their custody account if the client agrees to pledge the entire account balance as collateral as well as provide a personal guarantee. When you open a brokerage account, you need to specify if you want a cash account or a margin account. Most investors should be using cash accounts, in part, due to what appears to be a rising risk from regulatory arbitrage in the form of rehypothecation. If you borrow on margin, a broker can issue a margin call at any time, demanding you pay off some or all of your balance. A broker also has the right to sell your investments, triggering potentially steep capital gains if you have appreciated positions, without giving you an advanced warning or an opportunity to deposit additional cash or securities. There are various types of retirement accounts that, if started early, can set you up for a very comfortable retirement. A Roth Individual Retirement Account (IRA) is a special type of account designation put on a custody account that gives it some incredible tax benefits. However, it also has restrictions such as contribution amounts and types of investments held within the account. Money contributed to a Roth IRA comes from after-tax dollars, meaning you don't receive a tax deduction for it. However, as long as you follow the rules, under the current system, you will never pay taxes on any of the profits you generate from the investments held within the Roth IRA, nor when you withdraw those profits. You can buy stocks, bonds, real estate, certificates of deposit, and other asset types within a Roth IRA. A Traditional IRA is the earliest type of IRA. Investors can contribute money to it if they meet certain qualifications, such as their total income. Also, investors pay no taxes on certain types of investment gains held within the account until they can withdraw the amount at 59.5 years old or are forced to at 70.5 years old. A special type of retirement plan offered by employers to their employees, a 401(k) usually allows investors to put their money to work in mutual funds or stable value funds. Like a Traditional IRA, investors usually receive a tax deduction at the time the account is funded. There are also annual limits that are much higher than those for a Traditional IRA or Roth IRA. Employers often match contributions, such as a 50 percent match on the first 6 percent earned; and there are no taxes owed until you can begin withdrawing the money at 59.5 years old, with required distributions beginning at 70.5 years old. The term 401(k) refers to the section of the tax code that created it. In recent years, there has been a rise of so-called self-directed 401(k)s that allow the investor to buy individual stocks and bonds in the account. A 403(b) is a retirement plan that is similar to a 401(k) only it's offered in the non-profit sector. When an employee leaves their employer, they can opt to roll over their 401(k) balance and have it deposited into a Rollover IRA, which otherwise behaves like a Traditional IRA. A Savings Incentive Match Plan for Employees (SIMPLE) IRA is for small business owners with fewer than 100 employees who want to offer some sort of retirement benefits to their employees but don't want to deal with the complexity of a 401(k). A Simplified Employee Pension (SEP) IRA can be used by self-employed people and small business owners under certain circumstances, allowing them to put aside substantially more money than they otherwise would have been able to invest due to much higher contribution limits calculated as a percentage of income. Board of directors: A company's board of directors is elected by the stockholders to watch out for their interests, hire and fire the CEO, set the official dividend payout policy, and consider recommending or voting against proposed mergers. Enterprise value: Enterprise value refers to the total cost of acquiring all of a company's stock and debt. Market capitalization: Market capitalization refers to the value of all outstanding shares of a company's stock if you could buy them at the current stock price. Income statement: An income statement shows a company's revenues, expenses, taxes, and net income. Balance sheet: A balance sheet shows a company's assets, liabilities, and shareholders' equity. Form 10-K: An annual disclosure document certain firms are required to file with the SEC, Form 10-K contains in-depth information about a business including its finances, business model, and much more. Stock exchange: A stock exchange is an institution, organization, or association that hosts a market for buyers and sellers of equities to come together during certain business hours and trade with one another. The most important stock exchange in the world is the New York Stock Exchange (NYSE). Companies that want their shares listed on "The Big Board," as the NYSE is sometimes called, must meet strict criteria. If the company fails to continue meeting these requirements, it is subsequently de-listed. Price-to-earnings ratio: The price-to-earnings (p/e) ratio tells you how many years it would take for a company to pay back its purchase price per share from after-tax profits alone at current profits with no growth. In other words, the p/e ratio tells you how much money you are paying for $1 of the company's earnings. If a company is reporting a profit of $2 per share, and the stock is selling for $20 per share, the p/e ratio is 10 because you are paying ten times earnings ($20 per share divided by $2 per share earnings = 10 p/e). It also can be inverted to calculate the earnings yield. PEG ratio: A modified form of the p/e ratio, the price-to-earnings-to-growth (PEG) ratio factors growth into the metric to show that a company growing at 15 percent per annum and trading at 20x earnings can be cheaper than a company trading at 8x earnings and shrinking by 10 percent per annum. Dividend-adjusted PEG ratio: A dividend-adjusted PEG ratio is modified form of the PEG ratio that factors dividends into the metric to account for the fact that sometimes, slower growth is the result of a company paying out significant portions of its earnings in the form of cash dividends, which contribute to total return. Dividend yield: The dividend yield is the current yield of a common stock at its present dividend rate. If a stock is trading at $100 per share and pays out $5 in annual dividends, the dividend yield would be 5 percent. Volatility: Volatility refers to the degree to which a traded security fluctuates in price. Derivative: A derivative is an asset that derives its value from another source. As you consider the various ways in which to invest your money, continue to use these terms and definitions as a resource. With a greater understanding of this common terminology, you can feel more confident researching potential investments. What will you be charged if you hire an advisor?